I didn’t count her toes. I didn’t count her toes, or run my finger against each perfectly smooth miniature nail. I was about to; I was about to breath her in, to smile down at her and envelope those tiny feet in my trembling new-mama hands. But then it all went white. Baby bean, just a few minutes old, was taken from my arms. Faces hovered above me and needles pierced through skin, into my veins. I remember pain. Hot, pulsing pain, as the man who would save my life worked to stop the bleed. I remember turning my head, only slightly, as my oxygen mask tugged against my cheek. I remember gloved hands repositioning it so that my view became only ceiling once more. But I sneaked a peak. I caught a glimpse of my little girl, held tightly in her daddy’s arms as his ashen-white face stared at the scene before him. But nobody was looking at her. Nobody was counting her toes. In those moments, colour left my world and only white remained...detail and shading were redundant and sounds were muffled as time slowed down. Sleep invited me but I clung to the white, to the brightness, because subconsciously I knew that I had some counting to do. In my head, I must admit that I was thinking about myself. This is a hard sentence to write. My baby was minutes old and I was thinking about myself. About my pain, my dizziness, my confusion, my life. But I understand now, all of these months on, that my heart was bound to my daughter; I realise now that it was my heart holding on...my heart was holding onto the hope that I would live to count those perfect toes. I've admitted before, that I lost more than blood at half past six on that summer’s evening. I lost what I assumed was my right to claim those first hours of my daughter’s life outside of the womb. I lost what I assumed was my right to enjoy her 10-minute old self, her 11-minute old self, her 12-minute old self and so on. What if she had rooted for milk at minute 14, as the doctors set up yet another IV drip for me across the room? What if she had looked up in search of her mama’s face at minute 16, as the nurses told me to stay with them? What if she was counting on me to count her toes? It’s taken a while, but I am at peace with the questions above. I have a steady ache that those moments were lost for us; that I didn’t get to live out my fairytale birth, but I am at peace. Because in truth, the moments that I am talking about are just that; they are moments. And as life thunders on and as little bean grows bigger and bigger each day, those initial moments become surrounded by other moments in our vast fabric of existence. Never superseded, or overlaid, because a woman’s birth experience cannot be brushed aside or forgotten, no matter how uplifting or crushing it may have been. No, these ‘lost’ moments are threaded between others, interwoven between first words and knitted against happy gurglings. You see, these ‘lost’ moments are paid homage to every time that I crouch down next to little bean and take off her shoes; every time that I catch a wiggle of a big toe beneath grubby socks. These ‘lost’ moments are saluted every time a little foot smacks me square in the nose during a gymnurstics session...or square in the ribs during our sleep dance. In truth, these moments are with me at every new turn; at every junction of motherhood. They remind me of the gift that I was given; I am still here. I get to be mama to my wonderful little bean...and for that, I am ever thankful. 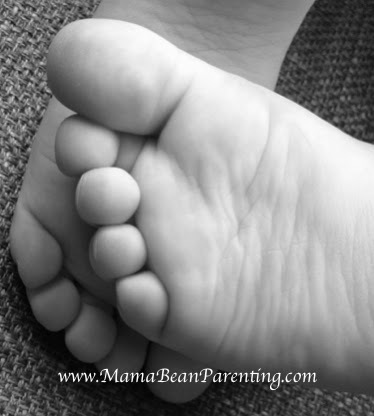 I don’t know how long it took me to actually count baby bean’s toes….in honesty, I cannot remember much through the overwhelming fog of love and fear and awe that engulfed me in those early weeks. But it simply doesn’t matter, as there was more for us; more time, more life, more chances. And there will be more again tomorrow. Because it’s never too late to count toes. Tears here too!! Absolutely beautiful. <3 Steph - Thank you! Wow...beautiful. Thank you for this - I really needed it! This rings true - what a lovely perspective! I am truly honoured to have played a small role in your healing process and am so touched by your words. Sending healing thoughts your way, mama. You are so very welcome Katy! Thank you so much for the support, so glad you liked it!